Updated 4th printing now shipping! What would life be like with death hanging over our heads? Most of us push the prospect aside until the end of our days. Not Steve Goodman. Diagnosed with a fatal disease at age 20, he managed to survive and thrive to write an anthem of his generation and become what many considered the most galvanizing entertainer of his time. What lessons did he learn and share with others while privately, then publicly, fending off leukemia for more than 15 years? The answers lie in "Steve Goodman: Facing the Music." The biography, released in 2017 in an updated fourth printing, is the comprehensive, untold story of a young man whose hilarious, touching and provocative music — "City of New Orleans," "You Never Even Call Me by My Name," "Banana Republics," "A Dying Cub Fan’s Last Request," "Go, Cubs, Go" and many more stellar songs — uplifted millions from the late 1960s to the early 1980s and continues to do so today. The book features fresh interviews with more than 1,100 sources, including Arlo Guthrie, John Prine, Steve Martin, Jimmy Buffett, Kris Kristofferson, Bonnie Raitt, Jackson Browne, Willie Nelson, Emmylou Harris, Randy Newman, Paul Anka, David Allan Coe, Judy Collins, Tom Paxton, Pete Seeger, John Sebastian, Leo Kottke, Gordon Lightfoot and Goodman's high-school classmate Hillary Rodham Clinton. Other interviewees include John Hartford, Phoebe Snow, Jackie DeShannon, Marty Stuart, Maria Muldaur, Studs Terkel, Mimi Fariña, Tom Rush, Bobby Bare, Carly Simon, Lily Tomlin, Michael Smith, Fred & Ed Holstein, Janis Ian, Bryan Bowers, Martin Mull, Chad Mitchell, Rosanne Cash, David Amram, Samantha Eggar, Tom Dundee, John McEuen, Jimmy Ibbotson, Jeff Hanna, Howard Armstrong, Jim Post, Carl Reiner, Doc Watson, Loudon Wainwright III, Jo Mapes, Len Chandler, Buzzy Linhart and David Geffen. The book's fourth printing includes more than 130 updates, fixes, footnotes and photos, all in the same 800 pages. 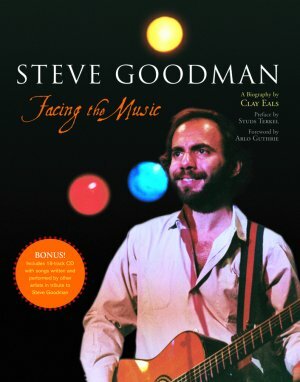 "Steve Goodman: Facing the Music" was published by ECW Press in mid-May, 2007. The first printing sold out in eight months, and the second printing sold out in 2011. The third printing sold out in 2016. The fourth printing“, released in 2017, can be purchased, at a discount from list price, at this website on the Online Store page. Header photos by Marlene Rosol, Andrew Czernek, and Marianna Samero. See uncropped photos on bonus photo page.